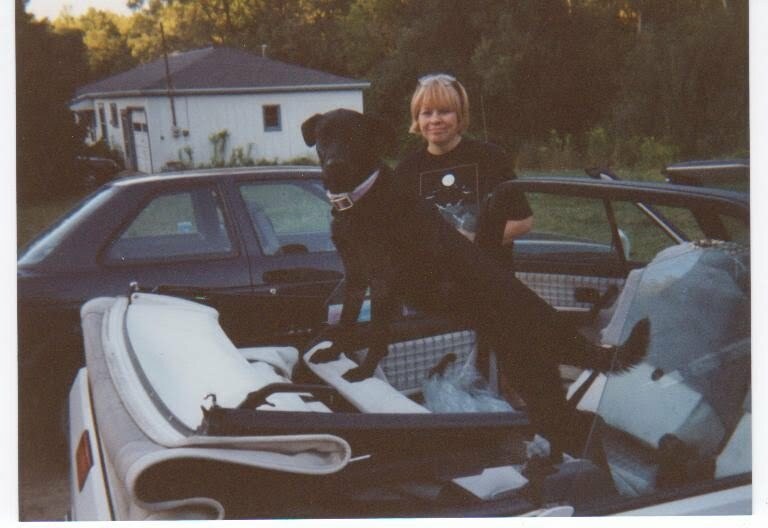 I’ve written a lot about my dogs over the years, here in this blog and in my books. Now they’ve both passed into the Summerlands and it feels funny to write things without them. 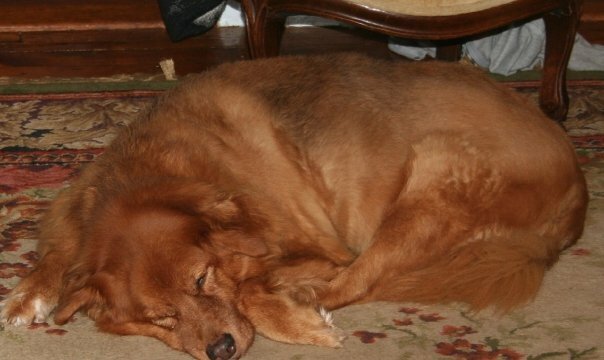 This is a tribute to Bob the Dog, pictured here at age 13, peacefully dreaming. He lived another year. Bob was a very enthusiastic and loving dog, embodying what I often called “Joie de Bobbie,” since he loved life. I also called him the High Hopes Dog and often hummed the high hopes song. One time, the man who co-owned the dogs with me took them out running. On their way home, they met one of my neighbors who was carrying the deer he had gotten. The neighbor put the deer down and started chatting. Then he started laughing. Both men turned around and saw Bob trying to tug the deer carcass away! Always hopeful, nothing was too large for Bob to overcome. Bob was also very into the energy of the pagan circle. Several times, he made his way into the circle. Once when the sacred masculine energy was invoked, Bob came into circle, plopped himself in the middle and started liking his private parts. That cracked us up and was so fitting to the ritual. Once he came into the center as the priestess was leading the circle in a meditation on the birth of the Sun King. “You are my Sun King” is another one of his theme songs. Even at his most feeble and tired, Bob greeted us with a wagging tale and a bright eye. Mike and I were both with him when he passed. It was the day after our wedding and we were talking and he was in the center of our circle when we realized that he was passing. I stroked him as he struggled with his last breaths. Finally his poor old heart gave out and he exhaled. I could feel his spirit romp to the next life, with wagging tale and supple body. He’s still here in my heart. I miss him very much and he graced my life with many stories and a lot of joy. His death was smelly and messy and Mike and I were there to take care of it. Since he died at home, we decided to take his remains for cremation the next day. As we were driving, I rolled down the window telling Mike the smell was overpowering. Then we both laughed. Bob had a way of keeping us intensely present and engaged in all of his actions, basic and sublime. He runs with the Goddess, Lady Artemis who protected him and loved him all his life. I am grateful to Her for all the critter blessings. Bob the Dog 1995-2009 was a wonderful companion, pal, and guy. Fare-thee-well till we meet again. Ya Did It Right the First Time! I like to think that I’m not a perfectionist but I do like to be thorough and meet certain standards set by me. That does mean that I like to research and do things thoroughly in the matters of spiritual learning. Sometimes living la vida Wicca, or living in the moment, presents you with different circumstances. At our tradition’s annual retreat, we had the wonderful teacher, Christopher Penczak shared his knowledge with us. In the course of his teaching and not particularly central to the theme, he commented that Hekate held the keys to the gateway to journeying between the worlds. Her crossroads are pathways to many dimensions and realities. During one of the meditations, Hekate came to me and gave me a key, saying that I would know what it was for when the time came. It was striking and kind of tangential to the weekend and I set an intention to do some journeywork on this subject and to talk with Hekate. Somehow, I didn’t get around to it, though the intention remained. I thought I had plenty of time. At the time, we were living with two very elderly and very dear dogs in declining health as well as planning our wedding for the end of September. I’ve written a lot about Congo and Bob and they are important and special; they’ve always lived their lives dedicated into the care of Lady Artemis. During the Labor Day weekend, Congo had an alarming episode and her decline became sharp. By Tuesday, she had stopped eating and drinking. We took her to the vet and he outlined her options. For a 15 year old dog, terrified of vets, these options weren’t happy ones. Mike and I talked over these options and decided to bid her fare-thee-well. As we talked it over with her, I talked to her about the care by Lady Artemis (whom I thank most gratefully for these long lived dogs), Hekate whispered in my ear, “I will take your little black dog for as she is special to you, she is special to me.” And so in the hands of a compassionate vet and vet tech, Mike and I held her and petted her as Congo slowly faded from this plane of existence. As I was driving home, I realized that I knew what the key was for. Under the beautiful blue skies of central NY, I opened the gateway and watched her wag her tail and run gracefully into the arms of Hekate. Congo, glorious and beautifully fit, runs with Hekate. Blessed be my girly-girl and fare-thee-well till we meet again. And yes, the lesson is that we get the tools and we use them. There is no reset button, no do-over, and no chance to learn it deeper or better because ‘ya did it right the first [and only] time.